Despite knowing we need to have good posture, most people don’t dedicate effort to improving it. Having good posture may only seem aesthetical such as making you taller and slimmer, but the facts is bad posture leads to health problems. One of the main symptoms of bad posture is fatigue. If it seems that you’re always tired, it could be your muscles are working harder by compensating for your bad posture. When you slouch your shoulders it may start to affect circulation, which can lead to vertebrae deterioration. When you have a job that requires you to sit for more than 6 hours a day, its important to have a stretching routine. This will help posture, and also decrease your risk of getting heart disease. While remain sitting for many time, you tend to gain weight because the blood sugar is affected. Besides all these effects you may suffer just due to the bad posture, you can add the chronic back, neck, and shoulder pain. But why do you have a bad posture in the first place? Despite in some cases bad posture is directly related to the fact that you’re sitting many hours a day or with laziness, there are other factors that also contribute to it. Factors like the shoe structure, genetics, injuries, self-esteem, and even weight, they all contribute to bad posture. Although you simply can’t control all these factors, there are some that you do control. What are the main benefits of having a good posture? Let’s just start with the obvious. Having a good posture is a key element of the entire body language. And this is directly connected to the way you feel. When you walk and sit straight, you’re transmitting trust to other people around you. You’re showing them that you’re confident about yourself. So, others will look up at you. And this will make you feel great about yourself but it will also help you make better decisions. But the benefits of having a good posture don’t end here. When you try to maintain a good posture throughout the day, you’ll be burning a lot more calories and you’re blood will flow normally. So, ultimately, it will also help you lose some extra weight. How can you improve your posture and have a straight back? The first way to improve posture requires focus and attention. You will need to be aware of your posture throughout the day. 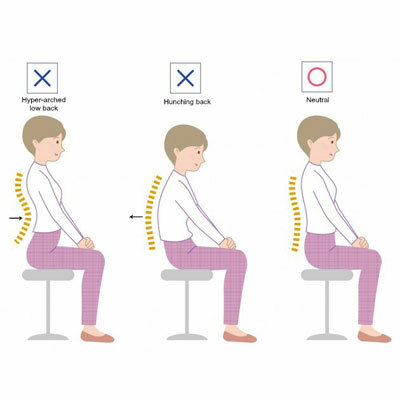 Before you stand up, make sure that you’re not forcing your back but your legs; when you sit, make sure that you have your back and head straight, as well as your feet aligned in the floor. Despite it may not be easy to implement these changes at first, you’ll be able to realize that this is one of the most powerful ways to improve posture. You’ll be the one in control. After a while, it will all become easier and natural for you. In the meantime, do what you need to remember. Just use post-its, the alarm clock on your smartphone, anything that makes you alert the entire day. Many people love to go to the gym. It’s not only good for their health as it’s one of the ways many people have to release all their stress and frustrations. So, if you are one of them, this might be also a great way to improve posture. When you have a bad posture, this means that some of your muscles are working harder than the others. So, they won’t develop as much. What you need to do is to start training all your muscles in balance and equally. This will allow you to correct your bad posture and you’ll also notice that your training results will improve. Men and women are very different when they’re working out in the gym. Usually, men like to train especially the muscles they see on the mirrors in front of them and tend to forget about all the others. In the woman’s case, they tend to work out more the legs and butts, forgetting about the rest of their bodies. So, making sure that you train every single muscle in your body equally is a great way to improve posture as well. As you already know, walking may lead to bad posture if you’re not paying attention to the way you walk. And this bad posture can lead to achy and tight muscles, joint stiffness, and fatigue. So, when you’re walking, try to keep your head upright, with your shoulders squared and straight. Your eyes should be looking straight ahead and all your weight should be well-balanced on your both feet. Despite the fact that when you’re sleeping you’re not fully aware of the positions you take, sleeping in a bad position will also affect your posture and the way how you feel. One of the best positions for having a good posture is to sleep on your back. However, if you’re one of those people who just can’t sleep this way, you can also try to use a firm mattress and changing your pillow to one that it’s not very hard or very soft. Using 1 or 2 pillows under your knees can also help. Even when you’re already implementing the first way to improve posture we mentioned, it’s important that you take some quick breaks when you need to sit for many hours straight. Being in the same position for a long time can cause a serious of problems that you can easily avoid with 5 minutes breaks every hour or so. As you see, there are many different ways to help you improve your posture. However, and despite all these are very effective, using a posture brace can also help you. So, make sure to check out the best posture braces.